No two startups’ journeys are exactly alike, but some companies have origin stories that are more unorthodox than others. Many founders are engineers or have a strong technical co-founder. Very few successful startups are founded by not one, but two designers. Lots of startups court venture capitalists and angel investors for seed funding. Few companies raise seed funding by selling boxes of breakfast cereal. Many startups have a long-term growth roadmap and a solid understanding of their market. Most founders probably wouldn’t spend what precious little money they have flying around the country to take pictures of people’s apartments. These are all of things that Rhode Island School of Design alums Brian Chesky and Joe Gebbia did to launch and grow what would become Airbnb. What began as an idea between two friends as a cheaper way for designers to find a reasonably priced place to stay when traveling for conferences soon became a hospitality powerhouse that changed the way we think about accommodation and reshaped the housing market in cities all over the world. What’s fascinating about Airbnb is how the company grew so quickly despite doing things that don’t scale in an industry known for its hostility toward new competitors. What made Airbnb such an incredible success in spite of almost overwhelming odds. Why, even now as a $30B company, Airbnb embodies the spirit of the scrappiest underdog startups. How Airbnb’s success forced an entire industry to reevaluate the importance of design. From the very beginning, Airbnb has been an unusual story of hardship, perseverance, and experimentation. The story of how Airbnb started is similarly unconventional—and it all began with politically themed breakfast cereal. I thought of a way to make a few bucks – turning our place into “designers bed and breakfast” – offering young designers who come into town a place to crash during the 4 day event, complete with wireless internet, a small desk space, sleeping mat, and breakfast each morning. Ha! Both Chesky and Gebbia were graduates of the Rhode Island School of Design, one of the most prestigious art and design schools in the world. Chesky was an industrial design major, whereas Gebbia double-majored in industrial and graphic design. After graduating, Chesky and Gebbia left the East Coast behind and moved to San Francisco. However, neither men had stable full-time work lined up. Before long, the two friends were hit with an unexpected increase in their rent. They needed cash—fast. This financial predicament, combined with an upcoming design conference, gave Gebbia an idea. With so many industrial designers coming to town for the IDSA/ICSID Connecting Congress, one of the largest industrial design events in North America, Gebbia noticed that virtually every single hotel room in the city was booked. Where were all of these designers supposed to stay? This is how Airbnb came to be. It wasn’t a grand, ambitious plan to revolutionize the entire hospitality sector—it was born of an urgent need for cash and a solution to an immediate problem. This is the genius of Airbnb. They did things that couldn’t possibly scale and figured out what would work by testing their hypotheses in the wild. The “Air” part of Airbedandbreakfast.com, the original incarnation of Airbnb, was literal. Chesky and Gebbia bought several inflatable air mattresses that would serve as their guests’ beds. They charged their first guests $80 per night, which was roughly $100 per night cheaper than most mid-range hotels in the city. Three people took Chesky and Gebbia up on their offer—a 35-year-old woman from Boston, a 30-year-old man from India, and a 45-year-old man from Utah. Chesky and Gebbia had successfully completed their very first trial run. The earliest incarnation of Airbnb might have felt and seemed a little punk rock, but it was actually almost perfectly situated between the two extremes of the hospitality sector. On one end of the spectrum, there were the high-end chain hotels and boutique guesthouses that were popular—but very expensive—across San Francisco. At the other end were hostels and budget motels, both of which were in comparatively short supply in the City by the Bay. Although Chesky and Gebbia’s idea was still very rudimentary, it had acres of potential. Tourism in San Francisco—both recreational and business travel—was worth $7B and hit an all-time high of more than 15M people in 2010. What if Chesky and Gebbia could persuade more people to welcome tourists into their homes? The more they thought about it, the more confident the two men became about the feasibility of their idea. This might not just be something people wanted, but a solution to an emerging problem the city urgently needed. One of Airbnb’s greatest strengths and competitive advantages wasn’t just the service’s proposed price point. Chesky and Gebbia wanted to commoditize trust in the accommodation sector by creating a marketplace where trust was integral to the entire experience. Finding a reasonably priced place to stay during a conference wasn’t difficult. There were dozens if not hundreds of listings on sites like Craigslist offering cheap rooms. What was difficult, however, was finding a cheap room for the night where guests could trust their hosts and get a good night’s sleep without keeping one eye open. The notion of trust would later underpin the entire Airbnb experience and become an integral part of Airbnb’s unique value proposition. Before Chesky and Gebbia could see if their idea could scale, however, they had to raise more funds. The problem was that both men were still largely broke, despite the apparent success of their proof-of-concept. Although Chesky and Gebbia were both designers by trade, the two friends were both strongly entrepreneurial. In the summer of 2008, having struggled to identify typical sources of funding such as venture capital investment, the two men began brainstorming ways they could raise funds and try to scale their burgeoning operation. At the time, the U.S. presidential election had taken center stage in the news cycle. Congressman Barack Obama was campaigning to become the first black president in American history. Long-time Republican Senator John McCain was Obama’s conservative opponent. The election gave Chesky and Gebbia an idea. In August 2008, the two founders purchased a large quantity of generic breakfast cereal in two varieties. They designed two different election-themed boxes—one for “Obama O’s” and another for “Cap’n McCain’s”—each of which featured a stylized illustration of the presidential-hopeful namesakes. Chesky and Gebbia’s idea was to sell these novelty cereals for $40 per box at convention parties and reinvest the money back into Airbedandbreakfast.com. The cereals were popular with convention-goers. The two friends sold roughly 500 boxes of each cereal. They completely sold out of the Obama O’s (but not the Cap’n McCain’s), and sales of their souvenir cereals netted them around $30k. Chesky and Gebbia’s cereal stunt is an example of the scrappy, underdog spirit that Airbnb would come to embody as a company. Chesky and Gebbia’s novelty cereals were certainly an unusual way of fundraising, but it wasn’t scalable. Yet it’s this exact approach that would come to define Airbnb as a company. Despite raising $30k, the cereal stunt didn’t raise as much money—or attention—as Chesky and Gebbia had hoped. Traffic to Airbedandbreakfast.com had slowed after the initial spike in interest following the launch of the novelty cereals, and the two friends later confessed they had to resort to eating the leftover Cap’n McCain’s cereal they had failed to sell. Airbedandbreakfast.com was bringing in just a paltry few hundred dollars per week, and the two friends had accumulated more than $20k in credit card debt. For a time, the future of Chesky and Gebbia’s idea was in doubt. Chesky and Gebbia may have been designers, but they had enough business acumen to recognize the potential difficulties posed by their unorthodox backgrounds. To preempt objections about the viability of their team and actually handle the technical overhead of running their site, Chesky and Gebbia hired Nathaniel “Nate” Blecharczyk, a 24-year-old computer science student at Harvard, as a third co-founder. While Chesky and Gebbia were the creative force driving the company, Blecharczyk served as technical co-founder and de facto CTO. Blecharczyk built the first incarnation of Airbedandbreakfast.com practically single-handedly using Ruby on Rails. Blecharczyk implemented a lightweight yet robust payment system that allowed the company to collect fees from guests, deduct Airbnb’s commission, then remit the remainder to hosts using PayPal and other online payment services. Blecharczyk had also smartly decided to host the site on Amazon Web Services, which kept costs down by allowing the company to use Amazon’s newly unveiled hosting architecture on an as-needed basis. While Blecharczyk wrote the site’s code, Chesky and Gebbia had resorted to decidedly old-school methods to grow their business. The two friends invested what little money they had into airfare to destinations such as Las Vegas, Miami, and New York City to meet with prospective hosts face-to-face and grow the company’s small pool of hosts. However, even Blecharczyk’s technical chops and a gradually growing base of hosts couldn’t help Chesky and Gebbia secure meetings with venture capital firms. Burning through what little money they had at a rapid pace, the three entrepreneurs decided to take their cereal stunt a step further in January 2009 by attending the presidential inauguration of Barack Obama in Washington, D.C., to hand out flyers for the struggling company—another great example of the guerrilla marketing tactics that helped Airbnb grow during those first formative years. Eventually, Airbedandbreakfast.com caught the eye of Paul Graham, head of the Y Combinator accelerator. Graham was intrigued by the idea. He was also skeptical that anybody would actually use it. However, Graham had few reservations about Chesky and Gebbia themselves. As detailed in a fascinating email exchange between Graham and Fred Wilson of Union Square Ventures—who famously passed up an opportunity to fund Airbnb, much to Wilson’s later regret—Graham was ultimately persuaded to support the growing company by Chesky and Gebbia’s passion and commitment. Despite his initial hesitation, Graham invested $20k in the growing company and accepted Airbedandbreakfast.com into Y Combinator in the winter of 2009. In March 2009, the company’s name and website were rebranded to the shortened Airbnb. Thanks to YC’s support and resources, Airbnb suddenly had the means to grow further. Shortly after joining YC, the company had roughly 2,500 listings and more than 10,000 users. That summer, Chesky decided he would spend several weeks living at various Airbnb listings to gain greater insight into his growing company. The number of hosts and guests was rising slowly, but for whatever reason, Airbnb listings in New York City weren’t performing as strongly as Chesky and Gebbia believed they should be. To learn more about the problem, the two founders booked stays at 24 hosts across the city. It was at this point that the two friends learned that some hosts weren’t making the most of their listings. Most hosts did a reasonable job of describing their digs to prospective guests, but the images of the listings left a lot to be desired. Many listing images were dimly lit and poorly framed. 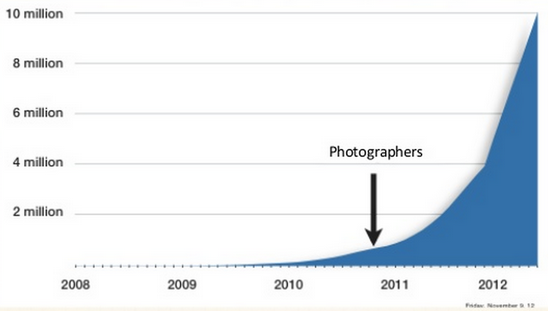 Others had clearly been shot using camera phones (which, in 2009, were still quite bad). Even the better photos were bland, generic, and unappealing. The solution to this problem was simple: take better images of Airbnb listings. Actually implementing that solution was much harder. Airbnb could have introduced image quality guidelines and barred hosts from uploading poor-quality pictures. The company could have embarked on a campaign to teach hosts the fundamentals of digital photography in an attempt to improve image quality standards across the Airbnb community. Instead, Chesky and Gebbia rented a $5,000 camera and took the pictures themselves. It would have been prohibitively expensive for Chesky and Gebbia to fly all over the world taking pictures of Airbnb listings themselves. Instead, the pair contracted 20 professional freelance photographers to do the heavy lifting for them. The service was immensely popular with hosts. By 2012, the Airbnb photographer program was so popular more than 2,000 freelance photographers were working for Airbnb and had taken more than 13,000 photographs of Airbnb listings worldwide. This wasn’t a luxury or frivolous spending—it had an immediate, powerful impact on Airbnb’s growth trajectory. Not only had Chesky and Gebbia been proven right by the success and impact of their photography pilot program, they’d demonstrated once again how doing things that didn’t scale could dramatically grow their business. By this point, almost nothing that Airbnb had done was scalable—yet the company was winning. By purposefully doing things that didn’t scale, Chesky and Gebbia had created an incredible business opportunity. Not only had investors failed to recognize Airbnb’s potential, they had also seriously underestimated the power of a bootstrapped, grassroots-style approach to growth. Few founders would have gone to the lengths Chesky and Gebbia had gone to in order to grow their company, which is why the two friends’ unorthodox methods worked so well. However, Airbnb’s cleverest approach to growth came just one year later, in 2010, when the site leveraged some technical ingenuity to dramatically broaden its reach—by “hacking” Craigslist. 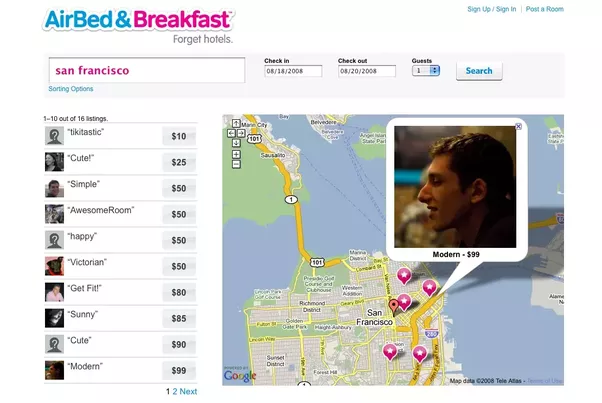 Chesky and Gebbia may have wanted to subvert Craigslist, but in 2010, the rudimentary classifieds site was still how most people found a sublet or cheap room for the night. Airbnb couldn’t hope to replace Craigslist overnight—but it could leverage Craigslist’s traffic to drive bookings and show Craigslist users how much better its service was. It did so by cleverly circumventing Craigslist’s terms of service by exploiting a vulnerability in how Craigslist handled bulk posting. Essentially, all Airbnb did was offer hosts the opportunity to post their vacancies to Craigslist as well as the Airbnb site. 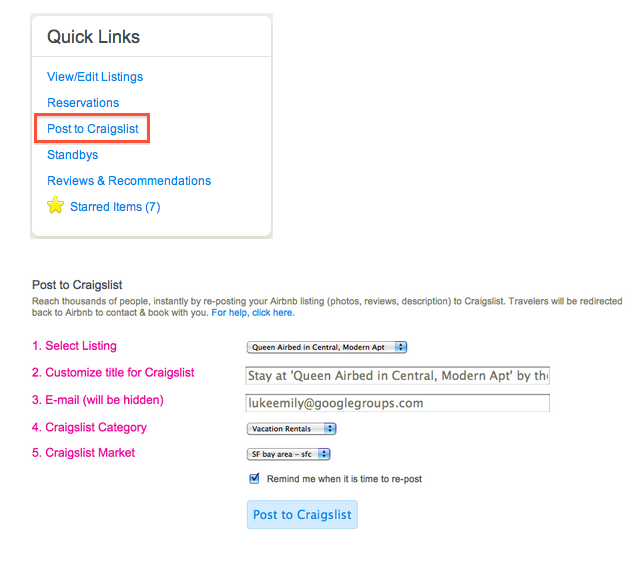 In the strictest technical sense, this did not violate any of Craigslist’s terms of service—but the method behind the hack almost certainly did. These emails were strongly benefit-driven and highlighted the increased earnings potential from cross-posting vacancies to both sites. 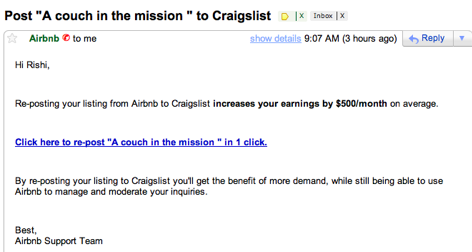 The emails didn’t mention that Airbnb was effectively piggy-backing on Craigslist’s traffic to gain greater visibility. The hack itself falls into the considerable gray area that lies between black- and white-hat so-called “growth hacks,” but the results were impressive. Airbnb was effectively doubling the visibility of each individual listing, which made it an attractive proposition to hosts. Since the vast majority of Airbnb listings now featured gorgeous high-resolution imagery as a result of Chesky and Gebbia’s photography initiative, Airbnb listings cross-posted to Craigslist looked a lot better than most of the Craigslist-exclusive listings, which meant they often outperformed Craigslist’s native listings by a considerable margin. Finally, Airbnb was also not-so-subtly enticing Craigslist users to switch to Airbnb with its superior listings, which featured significantly more information than the minimal Craigslist vacancies aimed at casual couch-surfers. Although the hack was a violation of Craigslist’s terms of service, the classifieds site did not pursue legal action against Airbnb. Beyond a few raised eyebrows, the entire incident flew under everyone’s collective radar. It’s difficult to imagine how Airbnb could have accomplished any more with a single growth hack. Of course, while the Craigslist growth hack tends to get a lot of attention, it was far from the only driver of growth during Airbnb’s crucial early growth period. Like so much of what makes Airbnb such a compelling platform, design played an integral role in the company’s growth. Both Chesky and Gebbia had been inspired by the design aesthetic and ideas of the late Apple co-founder, Steve Jobs. The two friends were both driven to apply similarly streamlined design principles to Airbnb, most notably the application of Jobs’s “three clicks” principle. Just as Jobs wanted iPod users to be no more than three clicks away from playing a song, Chesky and Gebbia wanted Airbnb users to be no more than three clicks away from booking a room. This went beyond merely improving Airbnb’s UI. Chesky and Gebbia wanted the Airbnb experience to be frictionless and effortless. Like Jobs, design wasn’t just how something looked as far as Chesky and Gebbia were concerned—it was how something worked. When Chesky and Gebbia began building Airbnb, nobody really believed they could crack the hospitality industry. However, a lack of investor confidence didn’t matter to the two founders. Less than two years after joining YC, Airbnb raised $112M as part of its Series B, led by Andreessen Horowitz—more than 14 times the amount it raised as part of its Series A round. Chesky and Gebbia were going to do whatever it took to keep going and build their business. Investors had given too much thought to what Airbnb would fail to become rather than seeing how Airbnb could fundamentally reshape the entire hospitality sector. Imagine critics’ surprise when, in 2011, Airbnb announced it was expanding to Europe. For the first few years of Airbnb’s existence, the company had grown quickly precisely because the company’s founders were willing to do bold, ambitious things that couldn’t possibly scale. However, as the company grew, these guerrilla-style growth hacks were becoming liabilities. As Airbnb eyed expansion plans overseas and sought to gain a stronger foothold in a highly regulated market, it had to shore up these vulnerabilities to ensure a pathway to continued growth. By 2011, Airbnb had a valuation of $1B thanks to its impressive Series B round. The company had grown by more than 800% the previous year alone, and Airbnb was rapidly approaching the 2M-stays-booked milestone. At that time, there were Airbnb hosts in 13,000 cities across 181 countries. In light of such phenomenal growth, Airbnb had to expand if it hoped to grow further. It did so by acquiring German Airbnb clone Accoleo for an undisclosed sum. This effectively gave Airbnb an overnight entrance into the European market and brand-new overseas headquarters in Berlin. Although international expansion may not sound like the actions of a scrappy, underdog startup, Airbnb went about its need to internationalize rapidly in much the same way it had done everything else—by identifying and responding to an emerging threat by doing whatever it took. As a two-sided marketplace, Airbnb lives and dies by the number of guests and hosts using the service. Airbnb’s rapid overseas expansion was critical to the company’s survival. Once incumbents get established, they’re very hard to displace. The Accoleo acquisition gave Airbnb an appetite for similar moves. Still riding high on its Series B round, Airbnb went on to acquire several companies over the next several years, the next of which was British competitor Crashpadder, which Airbnb acquired in 2012. Following that acquisition, Airbnb opened a number of offices around continental Europe, including Barcelona, Milan, and Paris. Speaking at a 500 Startups event in 2014, Airbnb product manager Rebecca Rosenfelt described the difficulties in not only expanding a rapidly growing company into overseas markets but also having to effectively grow both sides of the market—the supply side via attracting new hosts to the service and the demand side by encouraging more guests to stay in Airbnb properties. As if this weren’t challenging enough, Airbnb also had to grow both sides of the market while simultaneously navigating hideously complex regional regulations, laws, and legislation. In this regard, Airbnb’s history of inventive tenacity was invaluable. Convincing guests to try the service was relatively easy. Aside from the lower price point, the Airbnb experience that Chesky had worked hard to cultivate was much more attractive than the cold, detached chain hotel experience. The real challenge for Airbnb was stimulating the market on the supply side, as people were much more hesitant to welcome strangers into their homes—especially if the hosts themselves were traveling—than they were about finding a place to stay. 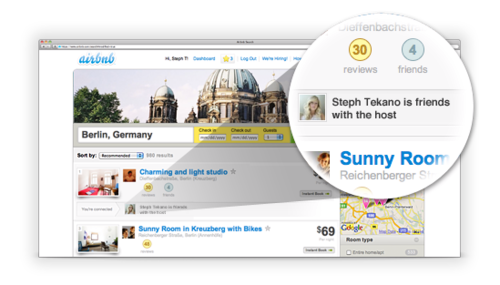 In 2011, Airbnb debuted the first of several social features the company would roll out over the coming years, Airbnb Social Connections. 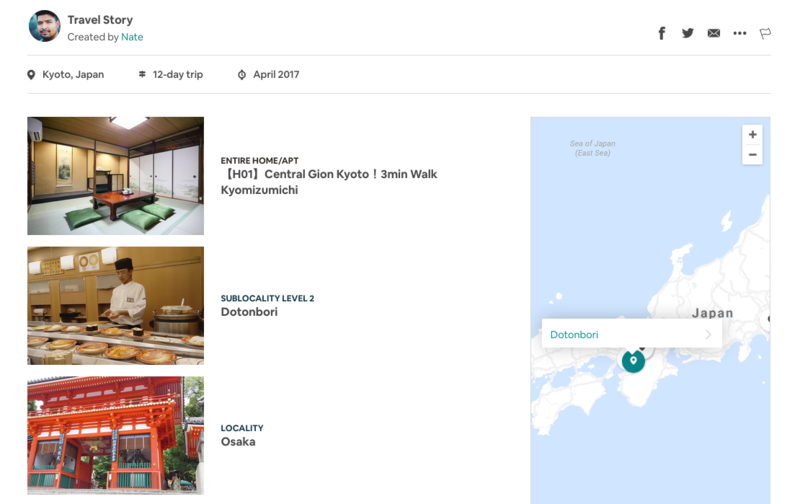 Built on an integration with Facebook’s API, Social Connections allowed guests to find new Airbnb properties based on a much wider range of search criteria and the data available on a user’s Facebook profile. Prospective guests could now see which of their Facebook friends had stayed at certain properties or whether a mutual connection actually knew a property’s host. Social Connections might not sound particularly innovative today, but the introduction of this feature was brilliant. Trust had long been a crucial part of the Airbnb experience. By adding a layer of social proof, Airbnb had made it even easier for new users to feel confident in their decision to stay at an Airbnb property. This offset some of the hesitations many new Airbnb guests feel before becoming familiar with the service. It also helped Airbnb with its demand-side market growth problem. Even better was the fact that, shortly after Social Connections launched, there were already more than 16.5M social connections among Airbnb’s userbase purely by virtue of Facebook’s growing popularity. International growth remained a strong focus for the growing company during this period, but Airbnb didn’t neglect the core functionality of its product. As the company expanded across Europe, Chesky and his team continued to conduct tests and experiments to further optimize the Airbnb experience, including several tests of Airbnb’s social features. One of Airbnb’s most significant product developments came in 2012 when the company hired a designer to work on a star-based ratings system. The idea was that, as and when users found a listing they liked the look of, they could “star” the listing and come back to it later. One of the first things the designer wanted to do was change the star icon to a heart. Initial tests revealed that replacing the star with a heart increased user engagement by 30%. That one experiment ultimately led to the introduction of Wish Lists, one of Airbnb’s most popular features. Airbnb was so confident in Wish Lists, it redesigned most of the site around the new feature. Just four months after the launch of Wish Lists, more than 45% of Airbnb’s 4M guests were using the feature and more than 1M Wish Lists had been created. This experiment wasn’t just a win for Airbnb—it’s an excellent example of the company’s culture of testing. Even new hires at Airbnb are encouraged to tweak things, make changes, and generally “move fast and break things.” It was this experimental culture and design-led thinking that resulted in such strong wins for Airbnb shortly after the introduction of Social Connections. Wish Lists also took Airbnb in a different direction as a product. Until that point, Airbnb had been largely utilitarian in its functionality. Users could search for hosts around the world, but to do so, guests had to have at least a rough idea of where they were traveling. With the introduction of Wish Lists, Airbnb became a more leisurely, aspirational marketplace. Users could now browse listings much more freely, and the site’s sophisticated high-resolution imagery meant that looking for a place to stay felt more like casually browsing package vacation deals on Groupon than using an accommodation booking tool. This tied back to Airbnb’s new social functionality perfectly. Airbnb may have been riding high between 2010 and 2011, but the company’s fortunes took a turn for the worse in 2011 when an Airbnb host in San Francisco was robbed while traveling on business. That an Airbnb host had been a victim of a crime was bad enough—if not entirely unsurprising—but the details of how the host’s apartment had been ransacked made headlines nationwide. To add insult to injury, the guest—only ever identified publicly as “Dj Pattrson” [sic]—sent the host regular, cheerful emails saying how happy they were with their accommodations, a cruel mind game that added a layer of menace to an already frightening situation. For some companies, a PR disaster of this magnitude could have been the end. For Chesky, it was a wake-up call. Trust had long been the core of the entire Airbnb experience. Prior to the high-profile robbery in 2012, Airbnb offered hosts a comparatively modest $50k insurance plan. Afterward, Airbnb introduced its $1M Host Guarantee program. This made sense for Airbnb, but securing that kind of insurance coverage was no easy feat. To offer such a bold guarantee, Airbnb partnered with Lloyd’s of London, an insurance underwriter known for providing unorthodox, high-risk insurance policies, such as plans covering the kidnapping and ransom of wealthy corporate executives. The company also stepped up its customer service game, offering 24-hour support to hosts. As reactive as Airbnb had been in the face of serious threats to its business, the company had been similarly proactive in making Airbnb stickier as a service. In 2012, Airbnb introduced Neighborhoods, a new way for guests to find places to stay. 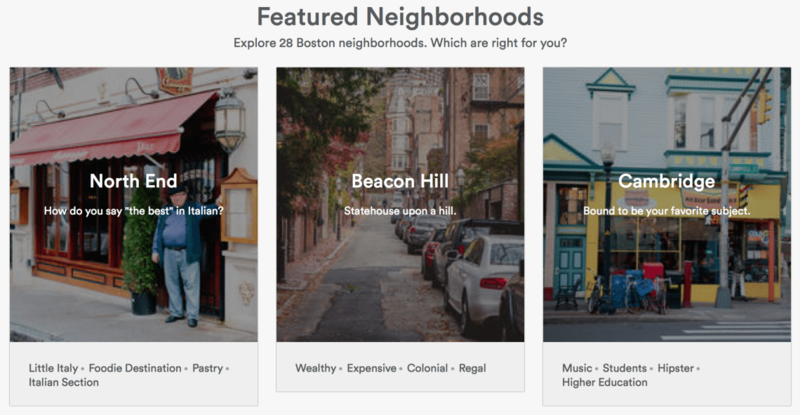 Rather than searching for a property based on price, guests could now search for neighborhoods within specific cities based on the kinds of things they wanted to do and the character of the neighborhoods in question. It allowed users to search for Airbnb properties by a larger set of criteria, including cuisine, walkability, and other factors that defied typical classification. It further positioned Airbnb as an aspirational tool for adventurous travelers who wanted to experience the real flavor of a city rather than the typical tourist experience. Neighborhoods was a significant step forward for Airbnb. The site had sought to position itself as an aspirational, experience-driven service for travelers, not tourists, for some time. The introduction of Neighborhoods made these formerly intangible variables a central part of the Airbnb experience. After riding the explosive growth of 2011 and navigating the PR disaster, 2013 saw Airbnb return its focus to product. 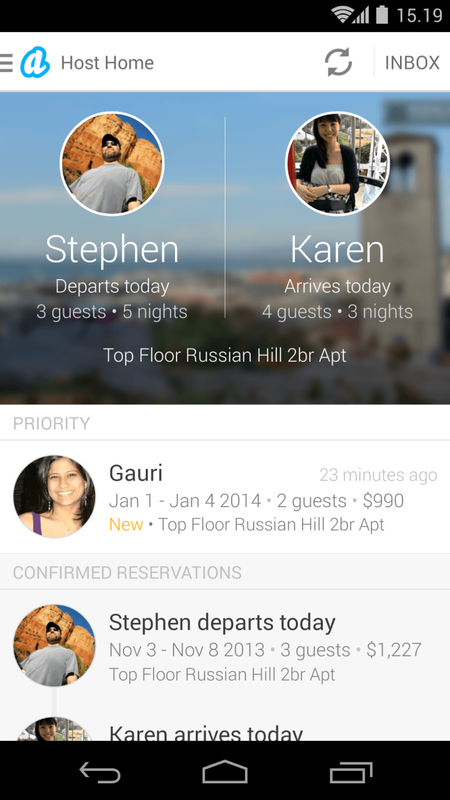 In November 2013, Airbnb unveiled its brand-new mobile app. The new app boasted a range of brand-new features, such as its Host Home dashboard and Host Groups. The app strongly emphasized the visual nature of Airbnb listings, highlighting the beautiful images of Airbnb properties the service was known for. Although Airbnb remained laser-focused on designing and cultivating the entirety of the experience of the site throughout 2013, Chesky was growing restless. He envisioned Airbnb as an end-to-end hospitality brand. In his words, “Our business isn’t [renting] the house. Our business is the entire trip.” However, Chesky wisely knew his limitations and the gaps in his personal knowledge. To deepen his understanding of the hospitality sector and where his company belonged within it, Chesky sought out the advice of a range of tech luminaries. He consulted with eBay’s CEO John Donahoe and Facebook’s Sheryl Sandberg about how to handle emerging competitors in Europe. He spoke with Amazon’s Jeff Bezos and Groupon’s Andrew Mason. Chesky met with former CIA director George Tenet to discuss corporate culture, and Apple’s SVP of Design, Jony Ive, about product design. These conversations were revealing, but Chesky still didn’t feel he had enough knowledge of the hospitality sector to make the kind of strategic decisions he needed to make to further grow his company. That’s when Chesky met Chip Conley, a titan of the hospitality industry who had introduced the concept of boutique hotels by reinventing a dilapidated motel in San Francisco’s Tenderloin district in the mid-1980s. To Chesky, Conley was the mentor he had been looking for. Although Conley was mostly retired from the hospitality business, Chesky pursued Conley relentlessly, eventually convincing him to become a part-time consultant for Airbnb. Conley would prove to be an invaluable sherpa for Chesky’s company and helped Airbnb’s CEO gain a greater understanding of the aspirational qualities of travel and how they could be leveraged by hospitality brands. By the spring of 2014—just seven years after Chesky and Gebbia first came up with their idea—Airbnb had more than half a million listings worldwide, 10M guests, and a valuation of $10B, making the rapidly growing company more valuable than entrenched legacy players including the Wyndham and Hyatt hotel groups. Airbnb’s culture of experimentation and testing had driven incredible results at scale. Airbnb had succeeded where everybody said it would fail. However, the company had yet to face its biggest challenge—governmental regulations that posed an existential threat to Airbnb’s very survival. Airbnb had created an entirely new market for itself and was busy securing its position at the top of the food chain. However, like the most disruptive companies, Airbnb had also made several powerful enemies—not least of whom were civic lawmakers wrestling with emerging affordable housing crises. As the company grew, it began to encounter serious legislative roadblocks that threatened the company’s future. Airbnb kicked off 2014 by redesigning its logo and branding, moving away from the dated, bubble-like logo toward a much cleaner logotype and brand icon. Unsurprisingly for a company founded by two designers, a great deal of thought went into the new branding, which reflected Airbnb’s core values and new aspirational direction. Inspired by Conley’s guidance, Chesky began to explore how Airbnb could diversify its services to capture the end-to-end experience Chesky had envisioned for many years. It also marked the beginning of a period of renewed focus on the UX of Airbnb as a product. In 2014, Airbnb introduced new tools to make it easier for hosts to accept and book guests, including the Response Rate and Acceptance Rate metrics. This gave hosts a better idea of how their listings appeared in Airbnb’s search tool and helped them optimize their listings and activity to maximize visibility. 2014 also saw the expansion of Airbnb’s Neighborhoods feature. Originally limited to 700 neighborhoods across seven cities, the 2014 expansion introduced Neighborhoods to an additional 14 cities. Shortly afterward, Airbnb acquired Localmind, a location-based Q&A tool, half-jokingly billed as “omniscience-as-a-service,” that allowed tourists to ask local experts questions about specific neighborhoods and places. Shortly after expanding Neighborhoods in 2014, Airbnb began offering cleaning and staging services to Airbnb hosts in select cities. Far from a mere maid service, Airbnb’s new product offering aimed to offer the kind of cleaning services you’d expect from a high-end hotel chain, including delivery of fresh linens and towels. Originally priced at $55 for a one-bedroom, one-bathroom apartment, Airbnb’s cleaners would also perform staging duties, ensuring that properties were clean and well-presented prior to guests’ arrival. This is another excellent example of how Airbnb actively grew both sides of the market. By giving hosts more tools to improve their earning potential, Airbnb achieved a delicate balance and gave hosts more power and control over how their properties were managed on the platform. However, for every step forward Airbnb took, emerging threats forced the company to take two steps back. In 2014, the city of San Francisco introduced its Office of Short-Term Rentals to oversee efforts to force Airbnb to comply with city ordinance concerning sublets. City officials and opponents of Airbnb claimed that the company was exacerbating San Francisco’s already chronic housing crisis by enabling landlords to run private residences as short-term hotels, prioritizing the profits from short-term lets over providing secure housing for San Franciscans. Airbnb wasn’t just embattled in its own backyard of San Francisco. Lawmakers in other critical Airbnb markets including New York City had expressed similar misgivings about Airbnb’s role in their own housing crises. Several other cities across the U.S. were mulling similar legislation. In what the company described as an “unprecedented step,” Airbnb filed suit against the City of San Francisco to block the city’s pending housing legislation that would bar landlords and property owners from renting housing via Airbnb on a full-time basis. Airbnb’s legal troubles were inevitable purely by virtue of how profoundly the company had challenged and reshaped existing paradigms—particularly in verticals such as the hospitality sector, which has been historically resistant to and hostile toward new entrants to the market. Legislation in cities like New York and San Francisco had failed to prevent their housing crises from unfolding to begin with. Reflexive legislative responses like San Francisco’s so-called “Airbnb Law” (PDF) were little more than temporary measures designed to slow—not stop—the city’s rapidly worsening housing crisis from devolving further. They also revealed the tension between many technology companies and the often-glacial pace of civic lawmaking as well as the critical lack of understanding about the emerging sharing economy among many lawmakers. In 2015, Airbnb raised one of the largest private funding rounds in history when it raised $1.5B in its Series E round led by General Atlantic. This gave Airbnb a breathtaking valuation of $25B. Almost exactly one year later in 2016, just shy of a decade since Chesky and Gebbia first launched their idea, Airbnb finally became profitable. However, while the company’s newfound profitability delighted investors, the company was mired in several legal battles across the United States. Lawyers in Miami, Santa Monica, and Anaheim sued Airbnb in the summer of 2016, followed by a countersuit filed by the City of San Francisco. Airbnb ultimately settled out of court. Having endured two years of bitter legal fights, Airbnb emerged bruised but the company was still immensely popular with users—a fact that no doubt helped the company ultimately triumph over its legal adversaries. In 2018, Airbnb introduced what Chesky described as the “biggest changes to our platform in our 10-year history,” Airbnb Select. Encompassing a range of brand-new site features, Airbnb Select introduced several new initiatives, including its new tiers for high-end travelers, Airbnb Plus and Beyond by Airbnb. Airbnb Plus offers so-called “superhosts”—hosts with exceptional guest reviews and a high response rate—and was essentially an official verification system for upscale residences aimed at more affluent guests. Beyond by Airbnb focused on the entirety of a guest’s travel experience from start to finish, much as Chesky had long envisioned. Both Airbnb Plus and Beyond by Airbnb were clearly aimed at wealthier travelers. However, their introduction should have come as no surprise. Chesky and his team had made no secret of their desire to dominate the alternative accommodation industry by emphasizing experiences over reservations. The two programs not only made it easier for guests to find more luxurious digs for their trip, but also made it easier for upscale homeowners to market their properties to adventurous jet-setters—which meant more money for Airbnb. The final step in Airbnb’s journey from an accommodation booking site to global travel companion service came in May 2018 with the introduction of Stories. Building on the foundation first laid by Chesky and Gebbia’s photography project, Stories allows users to create travelogues of their travels around the world. In addition to the gorgeous high-resolution imagery seen in featured Stories, these user-created guides also boast interactive maps detailing the various stages of users’ travels as well as shots of their accommodations, of course. The introduction of premium tiers may have been a predictable move for Airbnb but that doesn’t diminish its impact. By targeting affluent and business-class travelers with luxurious, high-end properties, Airbnb has now expanded to offer services to almost all travelers regardless of destination or budget. Airbnb can now target and provide services for practically every type of tourist, from high-flying urbanites seeking exclusive weekend getaways in the world’s most cosmopolitan cities to backpackers looking for an affordable place to crash. In addition to vindicating its co-founders, Airbnb’s incredible growth and success in a field traditionally hostile to newcomers is a valuable lesson in tenacity and the importance of establishing a strong culture early on. As Airbnb continues to grow, however, the company is likely to experience more friction as it expands into an increasingly regulated space. Another challenge that Airbnb will have to overcome is how to convince a whole new class of traveler to try an alternative to the traditional hotel experience as the company seeks to attract more guests—and hosts to house them. Where Could Airbnb Go from Here? Few people ever truly believed that Airbnb could muscle in on a space like the hospitality sector. Now, even fewer people can guess Airbnb’s next move. Where could Airbnb go from here? Chesky once said that Airbnb’s business isn’t renting the house—it’s the entire trip. With this in mind, Airbnb will almost inevitably further diversify its range of ancillary products in an attempt to entice more guests (and hosts) to try the service. These products will be crucial to Airbnb’s continued growth for two reasons. One, it puts additional pressure on new entrants into the market to provide the same level of service as Airbnb. Two, it further establishes Airbnb’s range of products and services as the standard in alternative hospitality. Potential ancillary services Airbnb might offer could include concierge services, property maintenance, and even transactional services such as payments processing. 2. A lateral move into property management. Until now, Airbnb has functioned as a marketplace. However, in order to maintain growth, the company may have to take greater risks, among the more likely of which is the prospect of a lateral move into formal property management services. In many ways, Airbnb is already a property management company; moving into hotel management on the consumer side—i.e. Airbnb-branded hotels—and commercial real estate management on the business side similar to WeWork would make Airbnb a formidable presence in an even bigger market. This would also signify a major shift in Airbnb’s business from a marketplace to a full-service property company. 3. More tools—and experiences—for guests and hosts. Airbnb’s Guidebooks feature was wildly popular with guests as it got to the heart of what makes Airbnb such an attractive proposition—the aspirational ideal of traveling as a local or insider rather than just another tourist. As such, it seems likely that Airbnb will soon offer more tools for both guests and hosts that focus on increasing the range of experiences available. This could include themed or all-inclusive vacation packages, such as safari expeditions or adventure holidays. Chesky and Gebbia had a bold, audacious idea and weren’t afraid to tackle a market that many so-called experts said was impenetrable. Their story may be unique, but there are plenty of lessons to be learned from Airbnb’s journey. 1. Do things that don’t scale. Come up with at least one thing—a growth hack, a marketing idea, a new product feature—you wanted to implement but decided against in the early days of your company. What was it and why did you ultimately decide against it? Chesky and Gebbia’s epiphany about their site’s photography was a crucial growth moment for Airbnb. What’s your company’s “photography epiphany”? What could you do to grow your company that isn’t a scalable idea? Before Airbnb took off, Chesky and Gebbia braved the freezing cold of a Washington, D.C., January to hand out flyers about their service. What unconventional or unorthodox techniques could you use to grow your company? How might this be more effective than your current strategy? Airbnb was a bold idea, but Chesky and Gebbia knew they were in for an uphill struggle by having to effectively grow both sides of the market as their company grew. How can your company do the same? Put another way, are you focusing exclusively on providing a supply-side solution, or are you actively thinking about how you can simultaneously stimulate demand, too? 2. Start with a strong, customer-focused culture. How do your background and professional expertise inform the direction and growth of your company? In Airbnb’s case, Chesky and Gebbia’s experience as designers was invaluable to the growth and success of their company, but it was a major liability in the early days—particularly as the company sought funding. How can you better leverage your expertise and experience as a founder? What unconventional knowledge or skills can you bring to the table as a founder? Are you trusting your hires to take creative risks? As Airbnb’s hearts vs. stars design test revealed, the company’s strongly experimental culture not only helped the company grow, but ultimately took Airbnb in an entirely new direction. Are you trusting your hires to make similarly experimental decisions in their work? How can you cultivate a company culture that encourages and rewards bold thinking? Airbnb’s response to the high-profile robbery of a host in 2011 was crucial in mitigating and controlling what could have been a PR disaster for the company. What potential problems could pose similar difficulties for your company, and how would you respond? Are you currently doing enough to genuinely protect your users or customers, or are you sitting on a PR emergency waiting to happen? 3. Don’t forget where you came from. Chesky and Gebbia exemplified the concept of hustle in Airbnb’s early days. Rather than grow complacent as their company became more successful, both men instead pushed themselves to grow as executives and get better at running and leading a rapidly growing company. How are you doing the same? How are you shoring up the weaker areas in your personal expertise or knowledge? Design was built into the foundation of the Airbnb experience from the very beginning. Does your professional experience shape your company and/or product? If so, how—and if not, why not? Could your background and knowledge improve your product or service? Are you neglecting the value and importance of design, or does your product genuinely delight your users? Airbnb’s most consistently popular features have been those that introduced and expanded upon the site’s social functions and made the experience of Airbnb less utilitarian and more aspirational. How can you do the same with your own product? Despite almost overwhelming odds, Airbnb succeeded due to the tenacity and perseverance of its founders. Rather than be dissuaded by their lack of business experience, Chesky and Gebbia instead did whatever it took to grow their company and ultimately changed the way we think about accommodations. It is inevitable that Airbnb will continue to face bitter opposition from legacy hospitality brands hoping to protect their dwindling business and civic lawmakers struggling to grasp the social and economic complexities of urban housing. Equally likely, however, is that the growing popularity of Airbnb will continue to shape how we travel, where we stay, and—most importantly —how we feel about seeing the world.